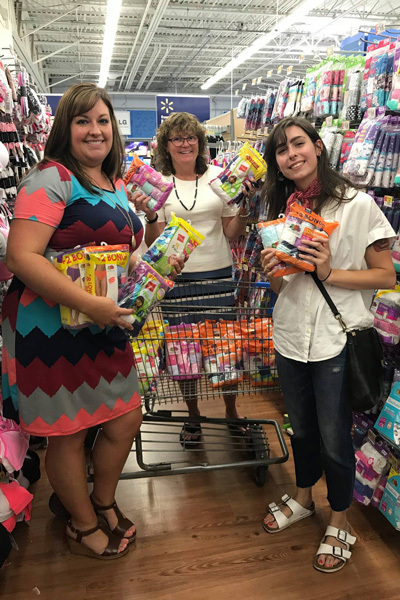 Quotarians Katie Rescenete, Betsy Lauber and Taylor Jones went shopping for a cause to donate notebooks, underwear and socks! Providing assistance in preparing children for learning is an activity for many Quota Members worldwide. Why is this effort such an important endeavor for Quota Members? It is the understanding that when students are supported with clothing and materials, they are more prepared to learn and that an educated citizenry leads to a ‘reduction in poverty, increased income and economic growth, improved health, lives saved, peace fostered, gender equality promoted,’ and much more. This important work is done by Quota International clubs individually and in partnership with other community organizations. For families in the United States, the cost of preparing for school has risen on average from $483.28 in 2004 to $687.72 in 2017. Helping to defray initial school expenses for students is where Quota members from Candlewood Valley (Connecticut, United States) to Indiana (Pennsylvania, United States) to Cupertino (California, United States) to Kent Valley (Washington, United Sates) step in to assist those who are facing a financial challenge. 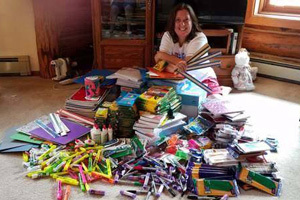 Members can be found shopping, gathering donations, and stuffing backpacks with pencils, pens, notebooks and other items to help give students the tools they will need in the classroom. Kent Valley donation of school supplies ready for distribution. In an acknowledgement that as the need for assistance grows so does the need to work in conjunction with communities as a whole, it does, in the words of the African proverb, ‘take a village to raise a child’. Quota Members in Cupertino working together with the ‘San Jose Mercury News Wish Book, Rotary Club of Cupertino, Inner Wheel, Silicon Valley Association of Realtors, Cupertino Auto Care, Saratoga Chamber of Commerce and individual donors’ allows for funds to reach further and in doing so makes the greatest difference in providing clothes and shoes for the largest number of children. While in Grey-Bruce (Ontario, Canada), members of Quota International of Owen Sound work with the United Way Backpack program to provide children from low income homes in that community with backpacks filled with age appropriate school supplies. 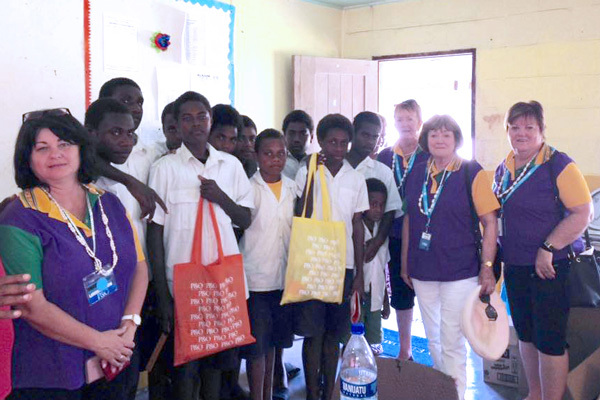 Teachers accepting stationery to students in a Port Vila school from Quota International of Ipswich members. Once the school year has begun, the need for materials and other items continues in regions with limited resources for wellness and education. Members of Quota International of Ipswich (Queensland, Australia) delivered stationery and school supplies to support a preschool in Port Vila (Republic of Vanuatu) built by the partnership between Live and Learn Vanuatu and ChildFund Australia. During their visit, they were able to spend time with the daycare children, kindergarten students and staff. Educational supplies were much appreciated as the country is still recovering from Cyclone Pam that devastated the island in 2015. Members of Quota International of Cebu and Sawang Celaro Daycare Center children. In the Philippines, Quota Members of Cebu, in partnership with Gota de Leche Foundation, are lending ongoing support for wellness and education at the Sawang Salero Daycare Center by providing children with milk, nutritious rice meal packs and vitamins. An additional component of this program gives rice meal packs to breast feeding mothers to help improve nutrition. Together the partnerships that are formed between Quota International clubs and other organizations fulfills the needs of the community. Providing back to school supplies and clothing is only one a few of the projects that Quota Members support annually throughout 14 countries worldwide. If you are interested in participating with a club with a back to school program or other project, please visit Quota International’s Where We Work page to find a location near you. Three hundred or so people squeezed into the local town hall a month or so ago. Laughter, music and the aroma of New Mexican food filled the air. Friends, family, co-workers, friends of friends and civic leaders mingled and chatted through the afternoon. Four generations gathered to celebrate the successes of a young person boldly living with cancer, to share with each other the joy and vibrancy of life, of knowing each other while helping this young person and his family through a tough time. They are a community. Quota members from Manila South providing special medical mission clinics in remote villages to support healthier communities. What is community? Community as defined by Webster’s Dictionary is: “the people with common interests living in a particular area”. That definition doesn’t quite hold the same spark as the group that was just mentioned so let’s look beyond this definition to the heart of it. Where does community begin? Does it begin when you are asked to do something or are placed in a situation that calls you to be part of a group? Community starts with the inspiration of being touched by an experience you have had, by an event that someone you love has experienced, or by something you have witnessed. Community, my friends, starts with you and starts with me being open to saying, “Yes”. If you have some hesitancy in jumping in to a group, event or activity, take minute to let the following quote speak to that fear. In Taree, New South Wales, Quota members provide comfort and help rebuild lives by sending hand crocheted blankets, towels, and rugs to survivors of devastating floods. Your participation in community is valuable.Whether it is spending time working at a medical mission as a volunteer, raising funds to ease a financial burden of a family facing a medical challenge, knitting blankets and rugs for flood survivors, or using organizational skills to plan an event, being courageous and willing to share your skills and talents makes a difference. When you say “Yes” to being in action with those around you, the world changes. Through the Philippines Feeding Program run by members of Quota in Manila, thousands of children living in poverty are nurtured and fed. It is the association of willing individuals to step forward together to fill a need that is the essence and power of community. The power of community is what has children be fed, schools to be built and has families facing seemingly insurmountable challenges be supported. Your community is waiting for you. Be bold, be you, say “Yes”.